Posted in Miscellaneous, on November 16th, 2007. Well, I don’t know about you, but I’ve been planning the Thanksgiving menu the last couple of days. We’re excited that we’ll have all three of our children here, with all 5 grandchildren too, who range in age from one infant up to age 13. Plus some other extended family too. That will make a table for 16, which is two more than our table can accommodate, so we’ll probably have to set up a small table for the children nearby. Everyone is bringing something, so that makes my job easier. I’m grateful for the help. I’ve always thought that Thanksgiving dinner is one of the most labor intensive there is, of the entire year. So much of it has to be done at the last minute – the potatoes, the gravy, the salad, etc. But I heard a suggestion the other day – potatoes hold real well in a crock pot. Just make them several hours ahead, preheat the crock pot and throw the entire batch in, cover, and it will hold for many hours. Sounds like a plan to me. So, listen up . . . that’s the phrase I seem to use when I’m about to share something important. I’m going to give you my prized (well, no, I haven’t really won a prize for it, it’s just prized by me!) recipe for cranberry relish. 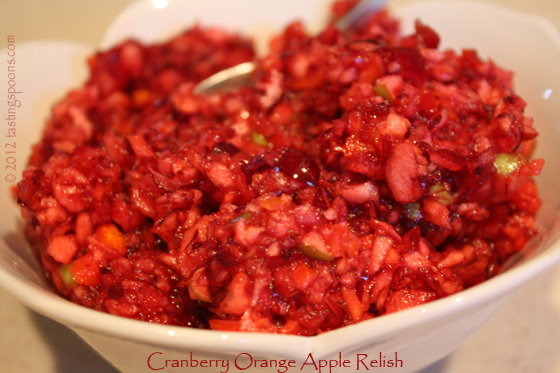 My mother introduced cranberry relish to our family’s Thanksgiving table back in the late 1950’s I think. It was just the chopped cranberries (and I was often the one who had to sit and hand chop the cranberries – very tedious, I might add), and minced orange, including some of the peel, with sugar. I made it that way for years. Until one year I saw a recipe in a magazine, I think, that mentioned adding apple and ground ginger. I love ginger and what it does for baked goods and other things too. I tried it, and it’s become the regular on my Thanksgiving table ever since. Over the years I’ve tweaked the recipe a bit – reduced the sugar a tad, and added more ginger. And I think the original recipe called for 2 apples, but I preferred the single one. So that’s why I call this a Carolyn original. I have no recollection where I first saw the recipe including the apple and ginger, so I can’t given any credit for it. This keeps for about a month, and is wonderful added to a turkey sandwich, or as a chutney type side with grilled meat. But it seems to have its strongest affinity to poultry. I can eat this straight out of the container, I like it so much. Just remember to make this a day ahead, if at all possible. It takes several hours for the flavors to blend AND for the sugar to do its magic with the fruit, drawing out the juices. NOTES: Cranberry relish has always been a favorite of mine, and I’ve made a bunch of different kinds over the years. But, this is my favorite, with just a bit of tartness. It’s also wonderful with grilled meats – pork chops, chicken and even steak. 1. You may use fresh cranberries, if available. If you’ve frozen them, just defrost before starting relish. 2. In a food processor, whiz up the cranberries first. Do not allow them to turn to mush. Scrape out into a bowl. Do the same with the apple, leaving the peel on, and add to cranberries. Cut orange into many small pieces, peel and all and do the same. Be careful there aren’t any large pieces left in the workbowl. Add ginger and sugar to the mixture, stir well and refrigerate for a few hours. 2. Will keep for about a month before spoiling. Per Serving: 90 Calories; trace Fat (1.4% calories from fat); trace Protein; 23g Carbohydrate; 2g Dietary Fiber; 0mg Cholesterol; 1mg Sodium. Am so glad you liked the result. Hope your family enjoys it too. On a roll right now. Have the Lemon Cake in the oven and made a double batch of the Cranberry Relish. I LOVE the relish. I dont know that it will make it to Thanksgiving! Thanks so much for sharing! I’m glad to be able to share this recipe. I love it too!